Anyway, I'd just like to thank everyone who took the time to respond to the survey. (If you haven't yet, please do! ) Now I know I'm actually talking to real people. It feels good to read your comments and I'm quite amused that some visit here everyday. WHY?? I feel so guilty now for posting so rarely knowing that some comes here daily. But really, to everyone who took part on the survey, thank you so much! I'll take all your answers to heart and give more time to improve Decor Me Happy. You guys inspire me! I'm also surprised to know that people prefer design projects posts. 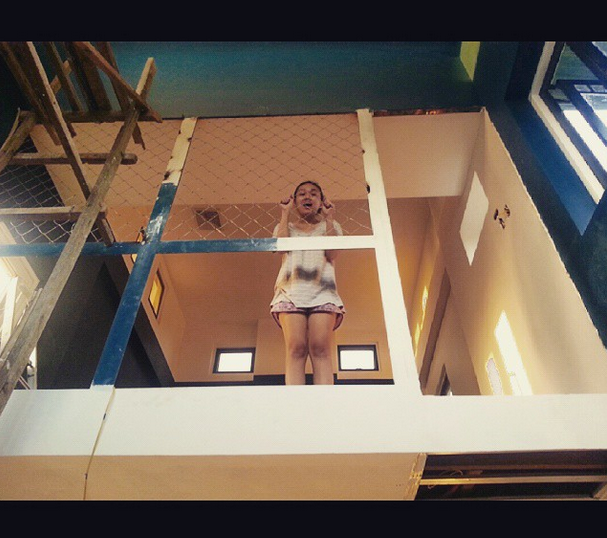 My love for the Tiny House made me assume that people love it too! HAHA... But I guess because every Tiny House posts are construction related story (boring), it's not that interesting to many of you yet. BUT that won't be for long, we're on the last stretch for the 3rd and loft level so we'll be doing the decorating soon enough. That is if we finally find the time to sort our boxes upon boxes of mess. 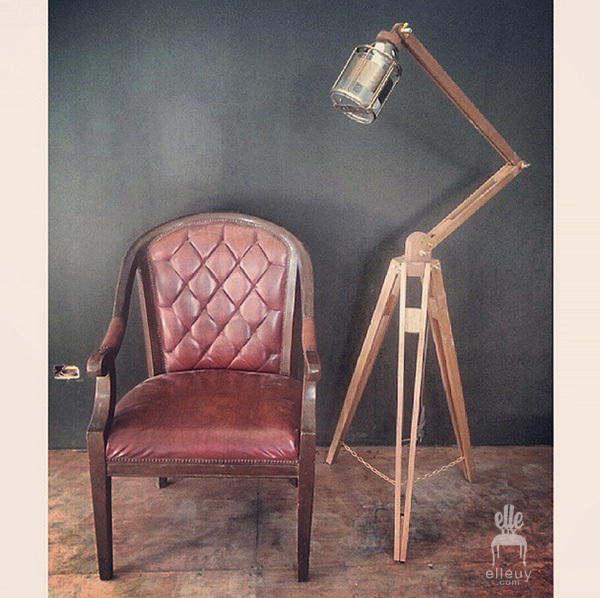 Would you believe that those are taken at the loft office? 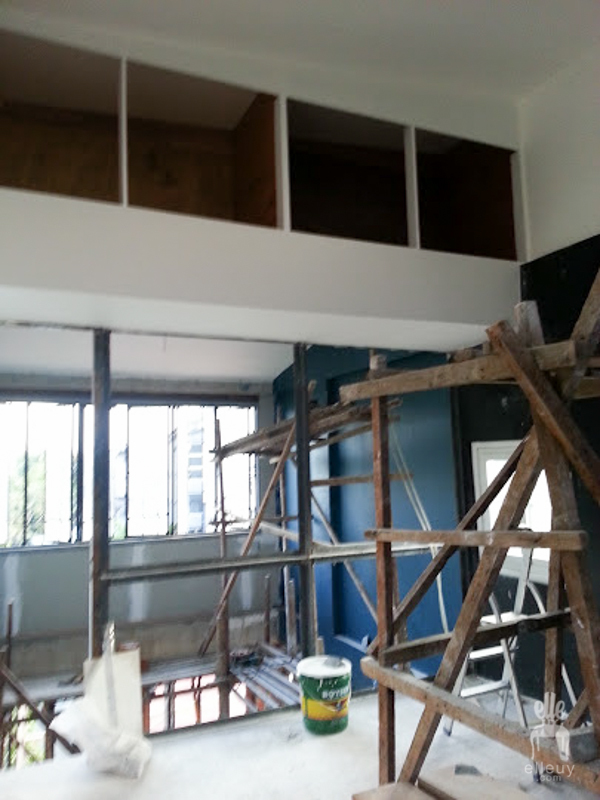 What was once just an airspace above the bf's former room, is now a room that can hold furniture! Just a few cabinet knobs to be installed and we're done at the loft. That's where we'll store all our stuff to be sorted before they go to their permanent space when everything is done. So not looking forward to the sorting part. Oh and a sneak peek! 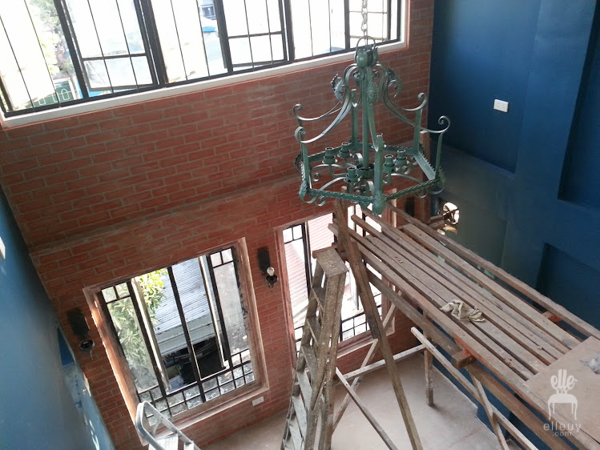 Looking down at the living room.. Blue walls, brick walls, our chandelier installed. It's looking quite wonderful in here. I've been in this blogging arena for five years already, what the what?!? I started oh so innocently because we renovated our old house, I have a lot of free time, and I just wanted to share. But that hobby turned into actual projects and this blog of mine got neglected. I'm not complaining though since I love my job, but I love this blog as well. And this blog helps me get projects too, you see, when prospect clients see/read the blog, they can know me better. They'll know my thoughts, they'll better understand my taste, and they'll just feel more comfortable since there's an instant connection. I don't know if I'm just imagining that, but that's how I feel when I meet a reader client. I mean, I know people read, I can see it in the stats, some send emails telling me they love the blog (THANK YOU!! ), but there are just few comments here and there. I understand though, I read a lot of blogs and I rarely comment. So I get you. But comments does make my day sometimes, just knowing someone out there is interested in my thoughts and house stories, is awesome. Here we go... Thank you!!! 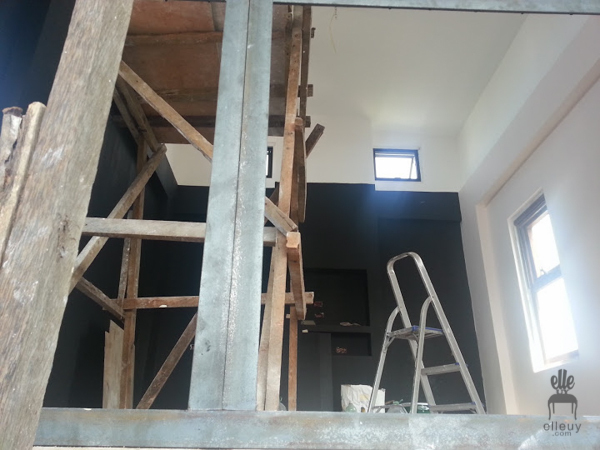 This blog has nothing but the Tiny House Renovation updates, which is of course understandable as the past half year evolves around trying build our home. But, we still need to work or that said house will not be done. Construction = Money pit. The bf has his thing, and I have mine, which as you may have already forgotten due to lack of any updates and new posts, design projects. Don't worry, I still have work and I still have other things to show you here, but my lack of reveal photos doesn't help. 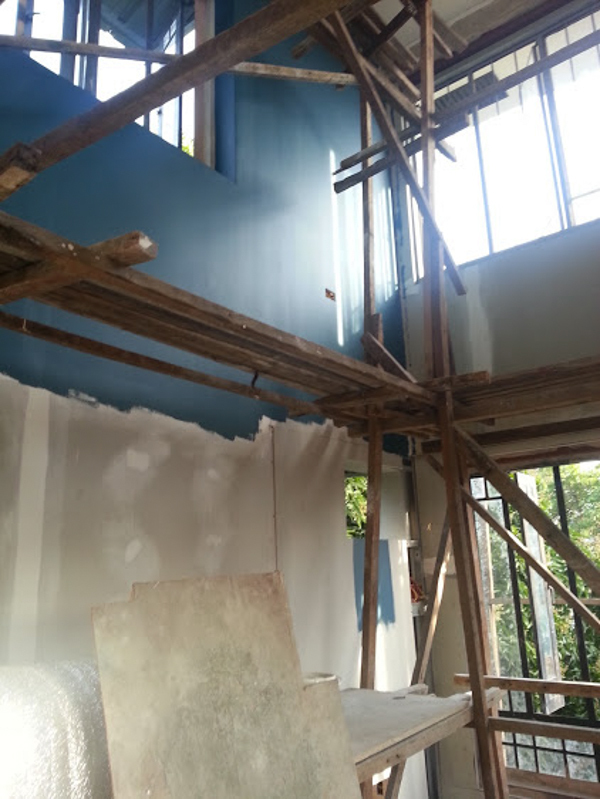 I really thought about it and decided not to post anything first before having the after photos on hand since I know it's annoying to lure you into details of a project and then keep mum for a year, without any final reveal, no closure. WHAT THE HELL HAPPENED TO PROJECT THIS AND PROJECT THAT?? Haha.. Story of this blog. So I have drafts of moodboards and progress that's still sitting there 'coz I haven't shot the space yet. I mean I love the design, of course, but what I'm talking about is the moodboard itself. Have you seen the first moodboard I did? That is actually my very first blog post back in 2010. Yes, it has been that long. Where the hell did those years go? Anyway, I'm always so giddy and proud whenever I managed to create a nice looking moodboard. Enough about those, let's talk about the project itself. It's a one bedroom condominium. 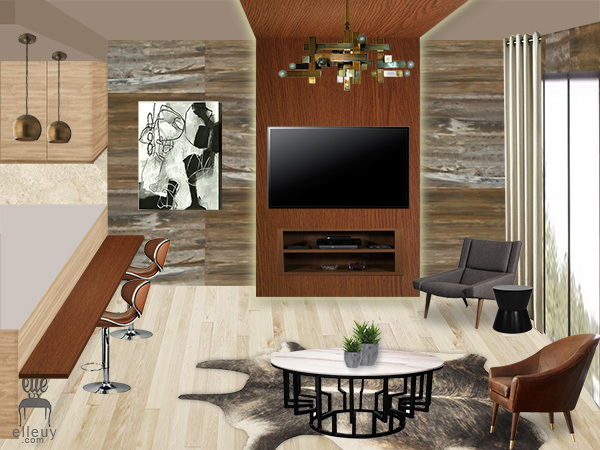 The client asked for hotel, luxe, and open feel. So the bedroom partition will be removed and we'll install a divider panel that can be open to have one big space, or closed to have privacy for the bedroom. 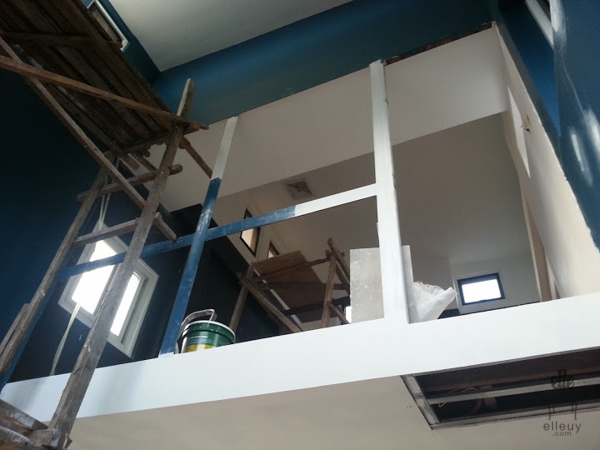 But since we're working from up down, the loft is almost done. It will be where you'll see us work, get creative, or be lazy and lounge on the daybed all day. Haha.. We actually discussed if we should put two lounge chairs in lieu of the daybed, but ultimately, our nap loving self won the argument, so daybed it is! Anyways, this space is the most controversial space for us. Decisions we're not easily made and lots of debate and discussions ensue. 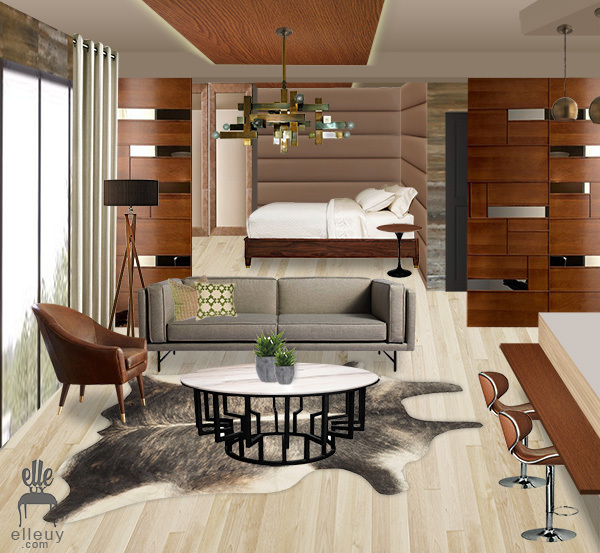 For the bedroom and living areas, we have the same vision and ideas so it's quite easy to come up with a final plan. But the loft, not so much. The layout we've already settled a long time ago. 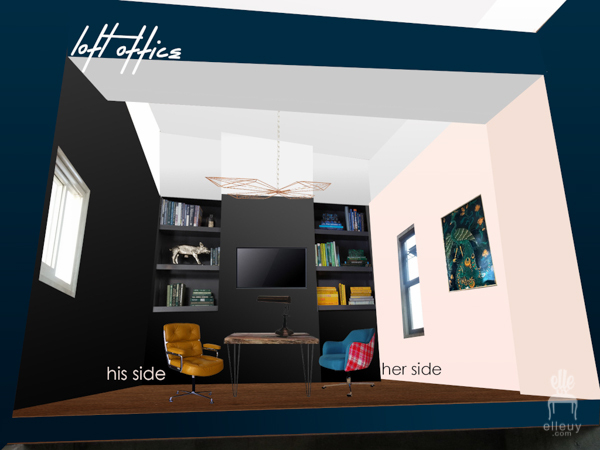 We'll have a shared table in the middle, and the bf will have one side of the office, and I'll have the other side. Basically, we can decorate our own side as we wish. But of course, we still have to discuss or it will look like a hodge podge of stuff and it won't make any sense. If it were up to me, I want a clean white blank walls to contrast the navy living area on the third level. But the bf is not so sold to white, he likes black. The exact opposite. Haha.. It's actually fine with me since I like black walls as well so yeah black it is. BUT, I don't want an all black room, I want a place for the eyes to rest. 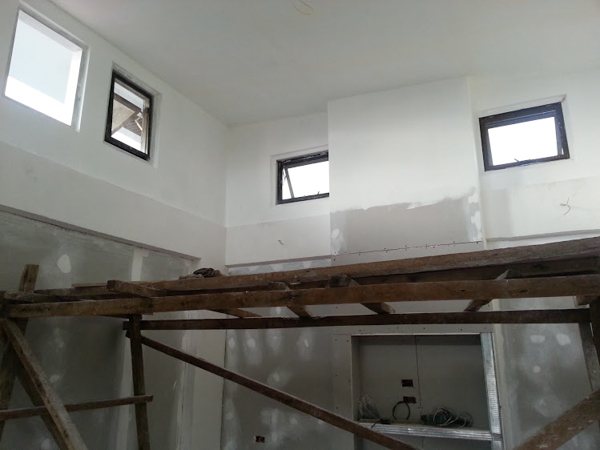 So upper walls and ceiling will be white. We settled that quite easily. I made a little mock-up of what the office would look like. Just edited the December progress photo above so this the same view as that. 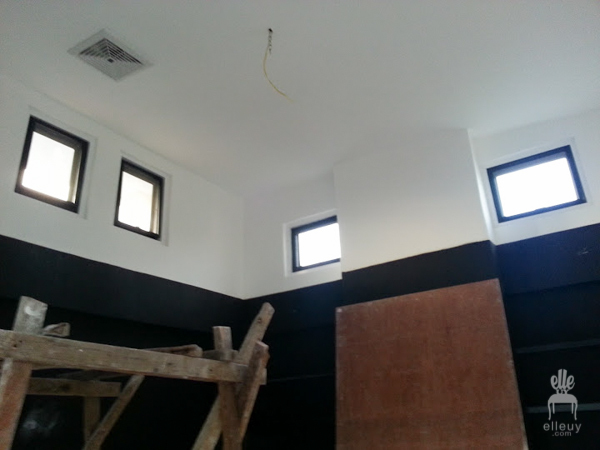 Black walls, white uppers and ceiling. PINK! Can you see the pink on "her side" ? Oh wait, I mean blush, or pale peach, or according to the bf, rosy white. Well ladies and gentlemen, that wall is the subject of a much heated argument. Me: "I want blush walls on my side"
BF: "Blush?? That's just pink." Me: "Ok I want pink walls." 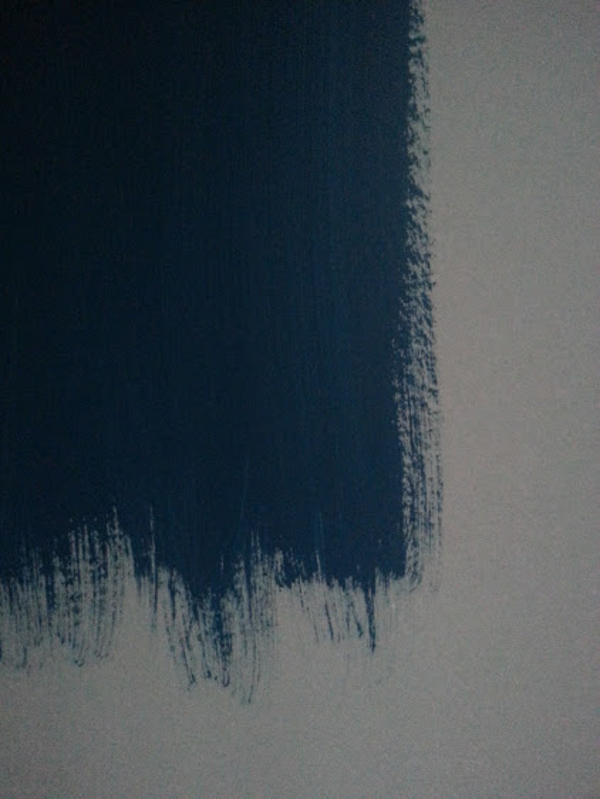 Me: "You've got your black walls!" BF: "You like black walls, I hate pink." Me: "It's not pink, it's a very pale peach." BF: "That's still pink. Show me photos." BF: "No. No. No. Maybe." BF: "Do a sample first before doing the whole wall." Me: "Okay!!! :) :) :)"
Thank you Bf, I know how much you hate don't like pink yet here we are with a pink wall in our office. Means a lot! I stuck with the plan of having a very pale blush color. I don't like baby pink nor bubblegum pink, I just want it to be a barely there color, just enough contrast to the white uppers and ceiling. Ok enough with that wall. Here's the view looking up the loft. (hello navy!) The left side will have cyclone wire, same thing used in fence, and to the right we'll have the stairs. 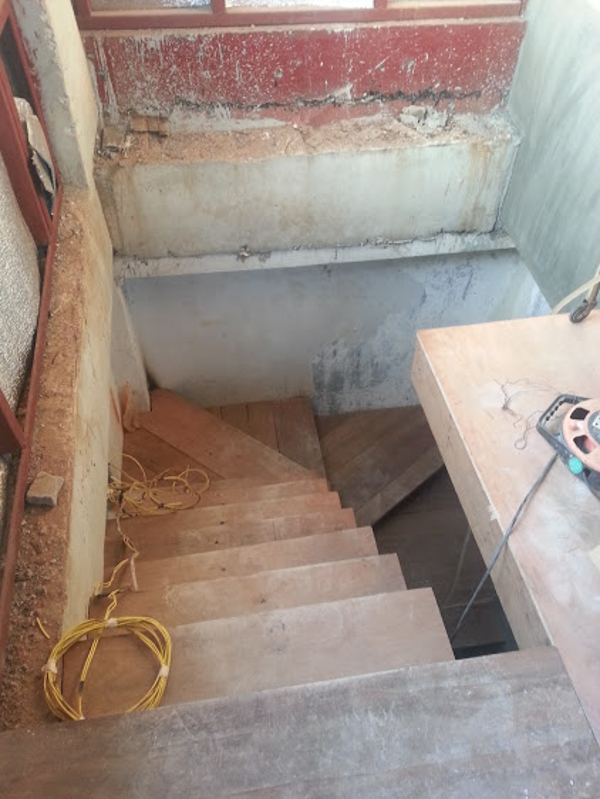 Oh the stairs, can't wait to have those installed so we'll not have to climb up the scaffolding to get to the loft! We'll have three shelves each on our side. 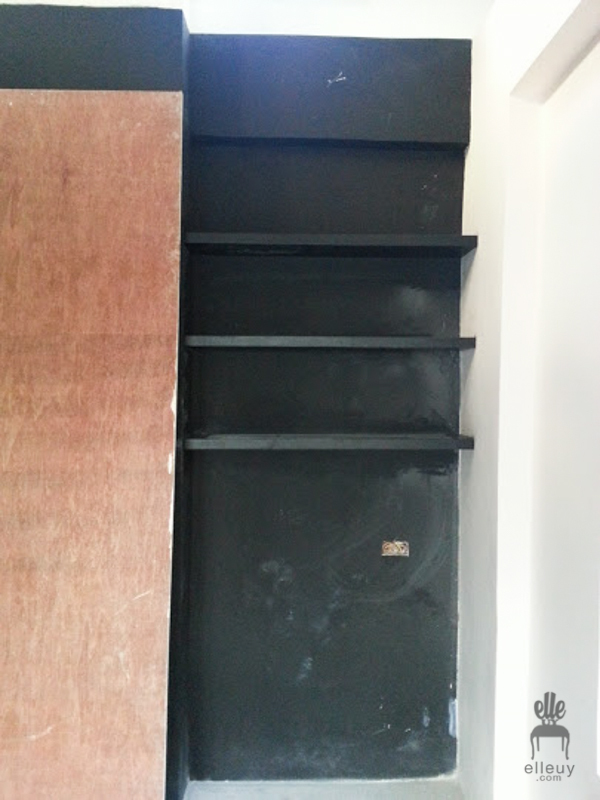 We bump out the wall in the middle to house the tv and run wires so we'll have the shelves in a niche. Though it's quite shallow and I have no idea what to put in here. Small books and our collection of decorative stuff probably. It's 8" in depth, since we don't want to bump the wall out too much, and the shelves should be the same depth as the wall. Now that I think about it, we should have made it 10". But no, we won't redo it so we'll just not buy big books. The space from the middle shared table to this wall is not that big, so we can't put anything too obtrusive and huge on our side walls. As for my side, I'll have a storage cabinet to the right of the window, and I'll hang my fave framed peacock above it. It's currently above my bed right now and I just love it. Plus it's black so it relates to the room. Above, we have 4 awning windows that will most likely always be open. Had them since this is the highest point of the entire house which means hot air goes here. Open windows to release heat, or at least that's what I'm hoping for. So far, it's really not that humid in here, but what do I know, it's not even summer yet so wish us luck. We'll have a lot more stuff than this, and we'll hang a DIY chandelier made by the Bf, I'll share them with you once it's done. This week and next, we'll finish the fence, stairs, and the floors so we can start moving items in here to free up the second floor so work can start on lower levels. The status of those spaces is a far cry from this. Third and loft = finishing, first and second = starting. 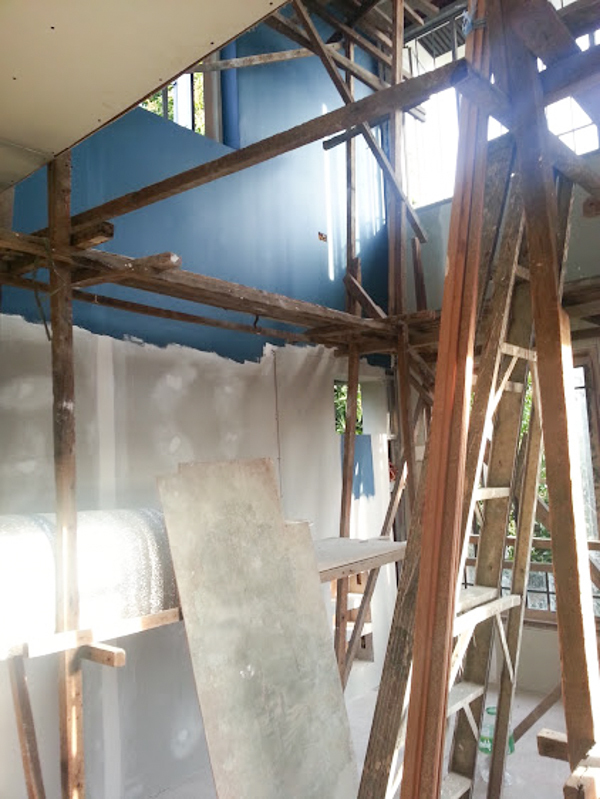 Tiny House Renovation in Six months: Interior Walls, Stairs, Navy Blue! I can't believe we're past the half-year mark! 6 months!!! It happened all too quickly yet too slowly which is quite confusing. Six months flew by, yet it's been months and we're not yet done. 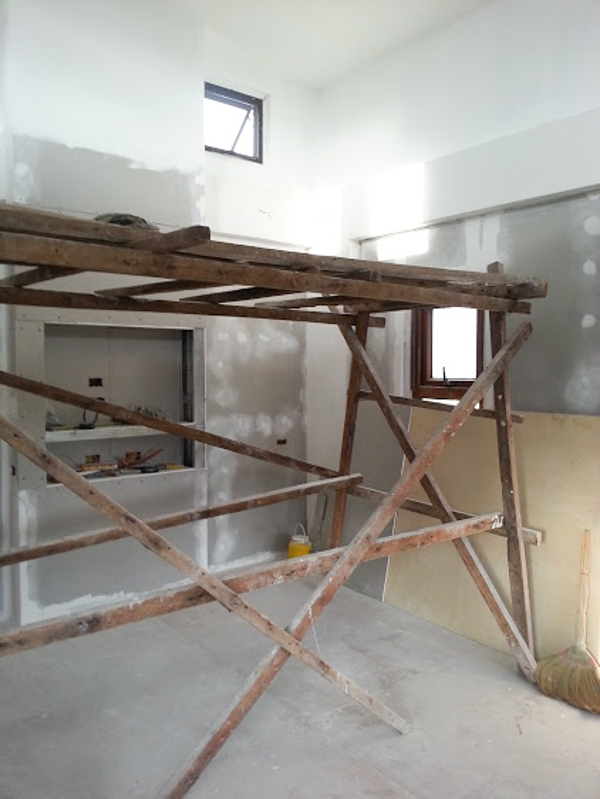 Normally, for other home expansion / construction, we should be about done by now. But since we're not going the typical route, it's been such a drag. Exciting, yes. But we're becoming so much more impatient these days that we are very close to completion. We can see a house, we are in it most days, yet we can't put our stuff in here, we can't design and decorate. But I know it will be over soon enough and we will be able to do whatever we want with it. But for now, here's where we're at. 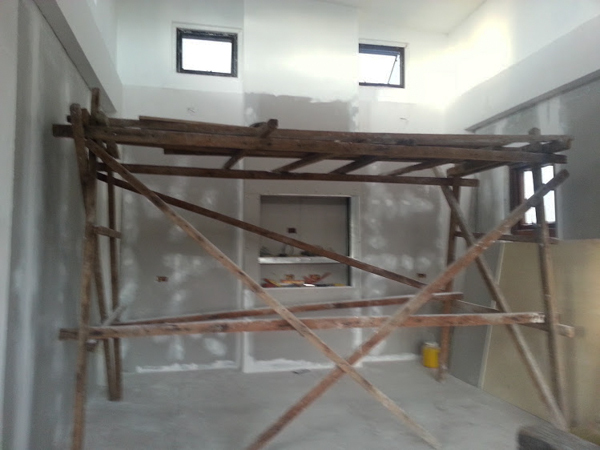 We've left you with no interior walls on the last update, like this photo below. 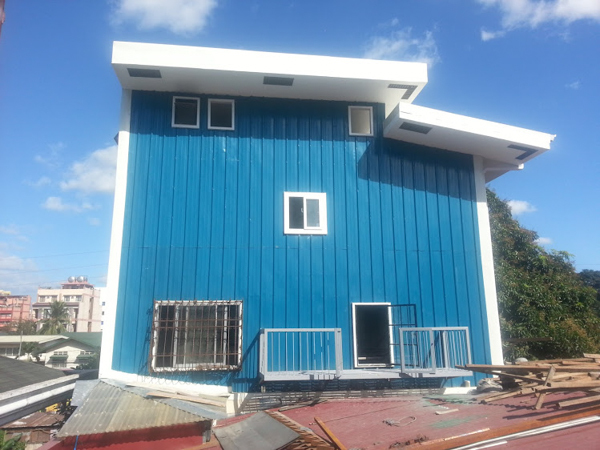 Exterior walls and insulation in place, but nothing inside. 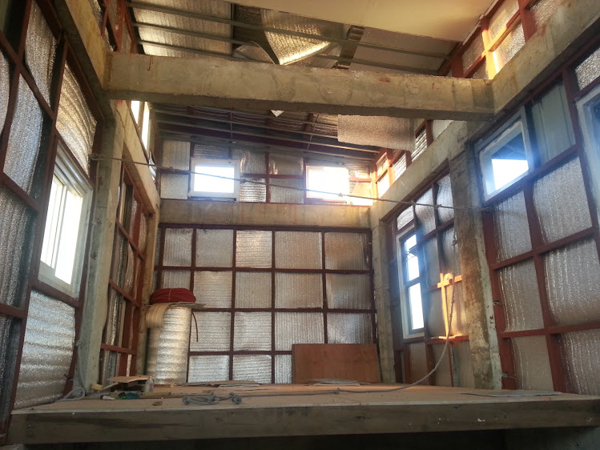 This is the loft area which will be our shared office. This is where we are now. Drywall installed, ready to be painted. And we're going black in this room. 2 walls will be black, and one blush pink. It sounds weird but it will be good promise. I made a little moodboard for this area but it's on the other computer so I'll post a separate entry about that. We've got a high ceiling in here, and you know how much I love high ceilings. It will keep even the smallest room from feeling too cramped. Big windows and high ceilings are small spaces best friend. 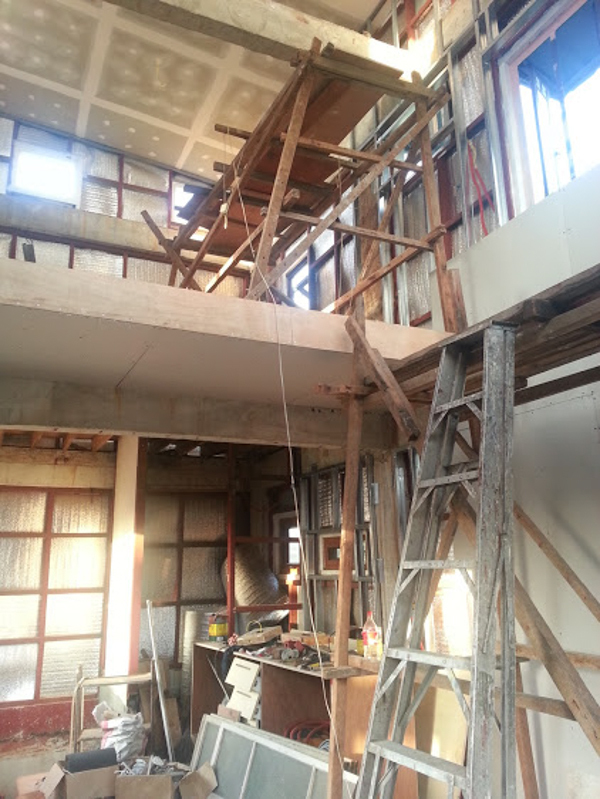 The action plan for this house is to finish the upper areas first and work down. 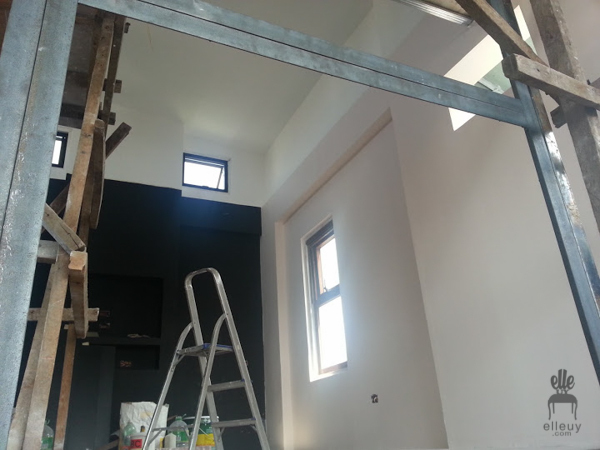 Hence this loft is looking a a bit closer to being done compared to the rest of the house. Which is ironic since we don't have stairs yet going to the loft, we need to finish the walls where the stairs will sit first before installation. 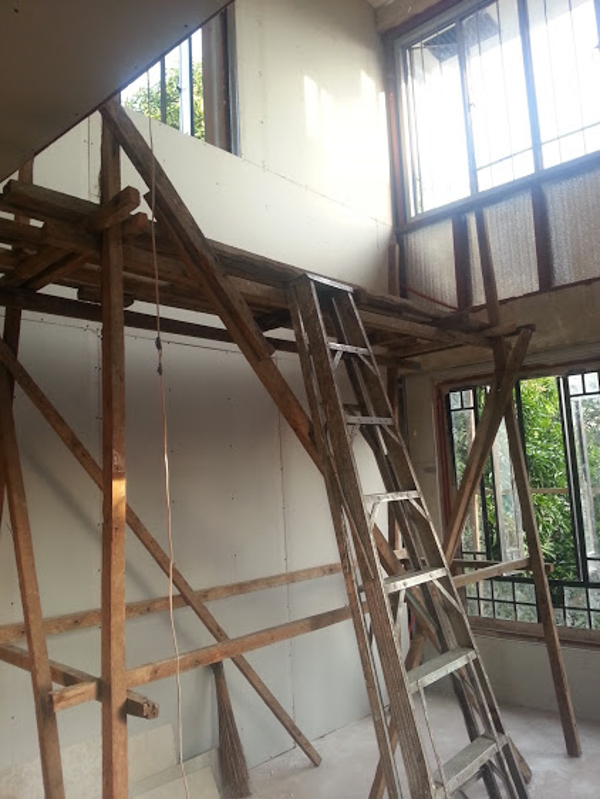 So we climb ladder and scaffolding just to appreciate this space. Haha.. 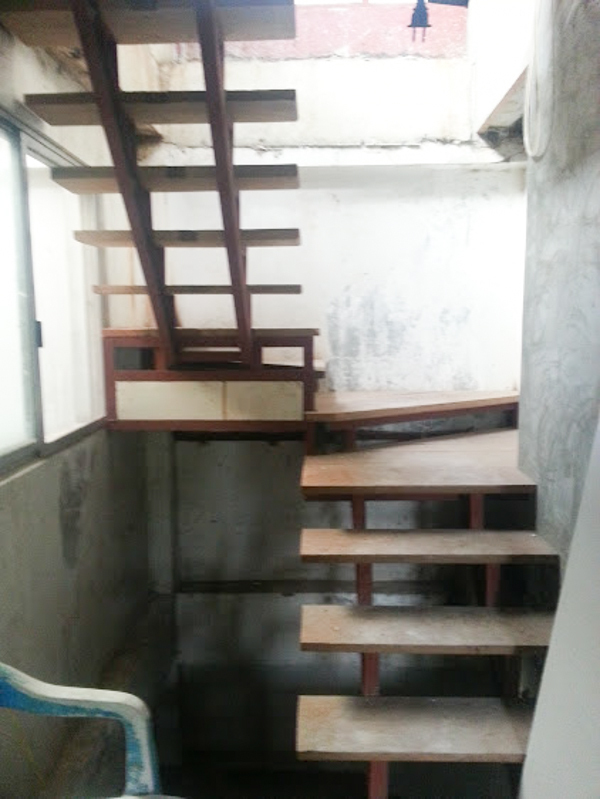 Speaking of stairs, we now have one complete stairs from first to third floor! We've reconfigured the existing stairs on the first level since it's taking so much space. I'll show you next time but right now, the first floor is such a mess, it's basically a stock room. That would be the very last area to be covered so that update will not come soon. Haha.. 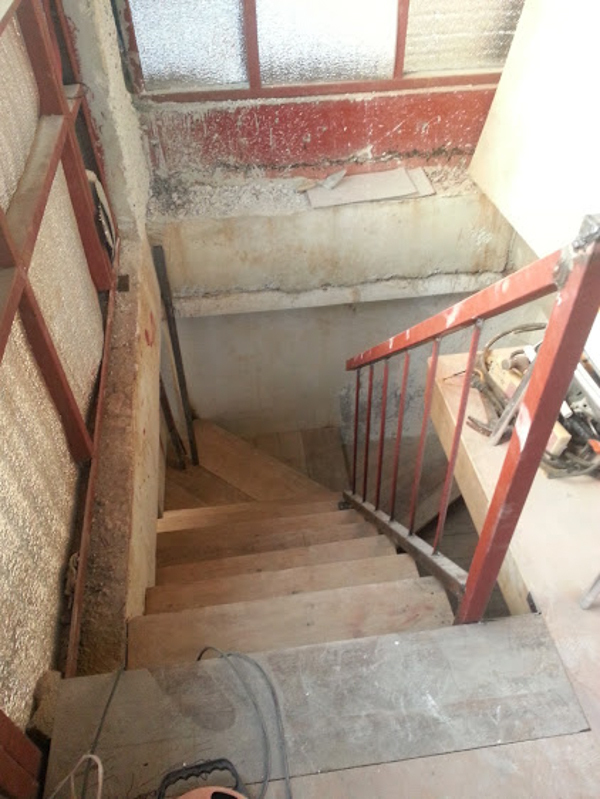 Since the original structure is only two floors, we constructed this stairs going to the third level. I don't have photos yet but we already have railings! Hooray! 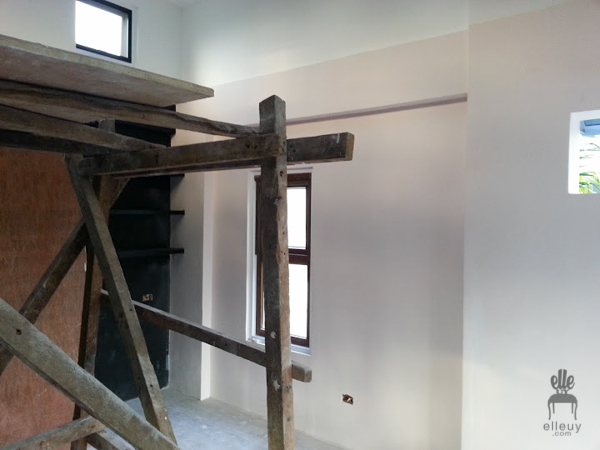 We'll be painting the walls, railings, and steel portion white, and we'll do the steps in a natural wood finish. Looking down the stairs from the third level. All the steps are purchased second hand. Let's get back up the third level. I think this will be my favorite area, with the navy walls and cognac leather sofa, with subway kitchen tiles, and brick walls.. I'm going to love this space!! Haha.. But lets get back to reality first. It will be a few months more before I can have all those. 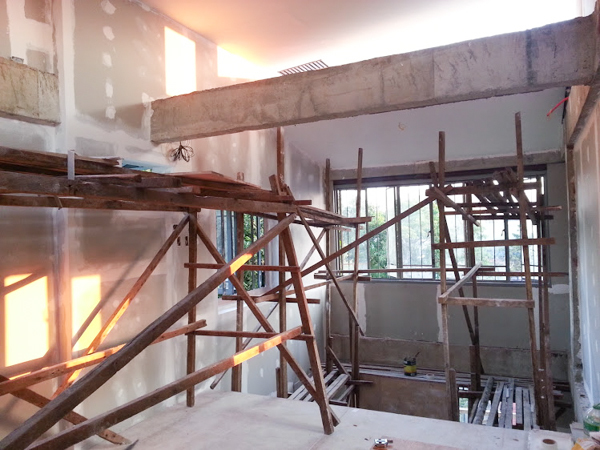 Here's a shot looking up the loft when they just started installing walls. Standing at the loft looking into the high ceiling part of the living room. Wall installation done. 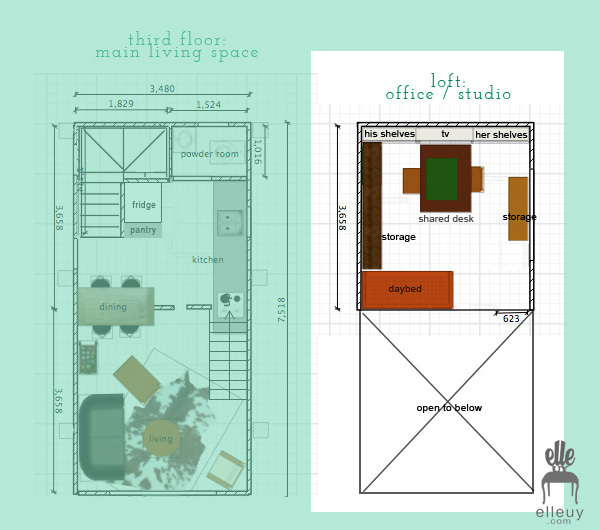 *To see the floor plan and to make sense of all this mess, click here. Windows, lots and lots of them! First coat of the navy walls!! I just saw this today and it's all sorts of wonderful. I'm a little afraid the dark walls will make this space, well, dark. But it doesn't, at all. Because of all the windows, it's still so bright in here and the walls just gives the space richness and some drama. Here's a close-up shot of the color. Instead of purchasing the expensive custom colors from the big depots, we just used Davies sun and rain elastomeric paint for outdoors. I'm thinking if it's good for outdoors, then it might be fine indoors right? Haha.. It's called delft blue, and it's a really good navy blue. It's not so dark, but it's still rich with just a hint of green. The wall with all the windows will be brick. Can't wait to purchase those and have them installed, it's going to be great. That's what we keep telling ourselves to have a little more patience. Haha! 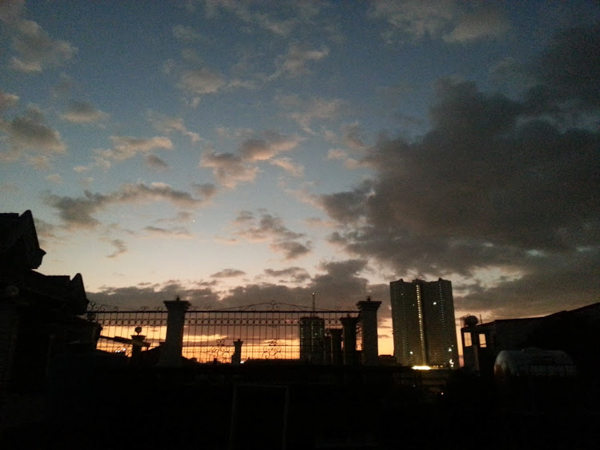 Can't wait to have proper chairs for the balcony so we can enjoy this view every sundown. 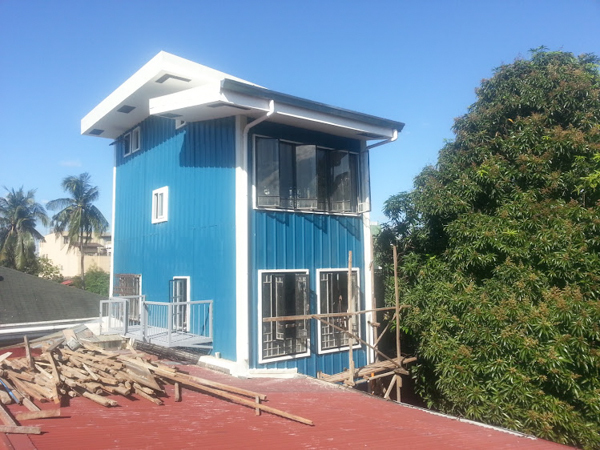 We'll probably be sipping tea, exchanging words of praises on how awesome we are for building a beautiful tiny house. Haha!